The Galapagos Islands are one of the most complex, diverse and unique ocean archipelagos in the world, which still maintains its ecosystems and biodiversity without major alterations, for that reason are known as the "Laboratory of Evolution." Its location and geographic isolation, its biological wealth and evolutionary processes as reflected in its unique flora and fauna, have earned the worldwide recognition. We have guides that show you the amazing Galapagos Islands by land or on an unforgettable cruise. Choose the package that meets your needs and meet your expectations. Marine IguaneThe Marine Iguana is an endemic species of Galapagos. This is the only lizard in the world that lives in the ocean, feeding on algae and can stay under water up to 45 minutes. Your Amblyrhynchus cristatus, which derives from its characteristic nose-shaped tip. Santa Cruz IslandIn the island population is the largest settlement of Galapagos, as well as the offices of the Charles Darwin Station and the Galapagos National Park. San Cristobal IslandThe only island with a freshwater lagoon, is characterized by the contrast between the beaches of white sand and black lava rocks. Isabela IslandIt is the largest island in the archipelago, has six volcanoes, five of them active. In each of them inhabits a unique species of giant turtles. Floreana IslandIt was one of the first islands to be inhabited in the Galapagos Archipelago. Pink flamingos and sea turtles nest on the island between December and May. 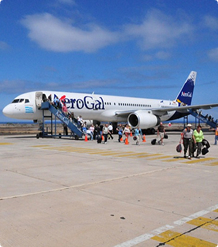 The flights to the Galapagos Islands are provided by airlines Tame, Aerogal and Lan. Flights depart from the city of Quito and Guayaquil, arriving in one of two airports on the islands Baltra and San Cristobal. There are no international airlines that go directly to the Galapagos. During his stay in the islands can do different activities such as hiking, diving and surfing, snorkeling, and watching several of its marine and terrestrial species. Flights to Galapagos IslandsFlights to Galapagos are provided by airlines Tame and Aerogal, can take flights from Quito or Guayaquil. The Galapagos Islands are located in the Pacific Ocean about 1000 km off the coast of Ecuador.